This is all done in memory of my son, Finn, who lived for 10 beautiful days in September 2013. He was not sick and his death was unexpected, but his brief time in the care of the NICU and their care for us after he died is why I want to do this. Through the experience of losing a child I have met so many other parents each with a heartbreaking story that either began or ended in the NICU. Anything I can do to help there be less heartache of this kind, or help bring comfort to anyone during their stay helps me heal. Knowing that Finn is remembered, and present in the minds of others gives him a little more time here on earth. Thank you. Finn Donald Brooke Millar was born late in the afternoon on September 18th 2013 at the Thunder Bay Regional Health Sciences Centre. He was a long awaited precious gift after years defeated by pregnancy loss, a son and brother to complete our family. 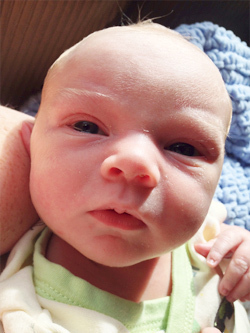 Finn was born healthy after a long labour and intense c-section, and spent his first couple of days in the NICU for extra monitoring after the rough entry. He roomed with mom for one night, then was released to go home on his fourth day. One week later Finn returned to the NICU where he died in his mother’s arms with his father and sister beside him on September 29th 2013. Finn’s short life was beautiful. He lived during some of the most breath-taking days of the year in Ontario along the north shore of Lake Superior. His life was full of colour and sunshine, every day he was home he felt the warm lake breeze on his new skin while snuggled in his soft blue blanket. He brought peace and hope to all of us. His big sister was finally, after 15 years a big sister, and she was so proud. It was an extremely happy time for me as a mother to see my two children together after all the years of waiting and wondering what that scene would look like. There were so many instant plans for the life we hoped to share with him, millions of dreams were about to come true. That’s what happens when you have a child: instant life plans, a future flashes before your eyes and you fall in love with every bit of it. Holding Finn felt like nothing could go wrong in the world anymore. Holding Finn felt like nothing could go wrong in the world anymore. There are times, at night that I can’t look out our front windows without physically feeling and being emotionally drawn into that night. If our front walkway catches the streetlights and the stillness is there I can physically feel the cold of the pavers on my bare feet as I chased the emergency response team that came for Finn. I left in a nightgown crying and begging them to save my baby boy, to bring him back to me. I’ve heard the desperation in my cry every day since. There was nothing anyone could do. Though Finn was revived (his heart began beating again) it was only with the help of life support. He was gone. I think I knew that the moment I found him. The day he died I cried the heaviest tears imaginable. I held him and all the tubes and wires as they told us we had to let go and say good-bye. I don’t think there was a dry eye in the NICU that day. I don’t remember names but I remember faces, there were so many faces that came close to my face - most often the memory is so overwhelming it takes my breath away – all the faces of people coming close to me to say something comforting, most of is garbled in my memory, just as most of my words came out garbled, nothing made any sense, but we were surrounded by people who were caring for us. There are some people who cannot be thanked for the work they do. It is impossible to find the right words. They put their hearts on the line every day. It takes a special kind of person to work in an arena of such immense feelings and be able to be both compassionate and realistic, focussed, detached and in the moment, scientific, biological and reactive…, they get the job done with determination. Everyone who cared for Finn whether it was when he first arrived or when he left did it with the greatest of effort, and genuine concern. Many of them attended his funeral and have remembered us long after. Every memory of Finn is a little bit of life for him, a little more time on earth. That is why we wanted to coordinate this fundraiser with the hospital. Finn’s days at TBRHSC were short, but days like his happen all the time. If there is anything we’ve learned through losing a child, it is that we are not alone. There are countless bereaved parents like us trying to find meaning in it all, and countless carers trying to help them through it. Whether your stay in the NICU is two days or months, every minute there freezes time. Nothing is more precious. Anything we can do to help more babies make their way home is a passing thought of Finn, and carries him along in the thoughts of others, which in a small intangible way makes him feel nearer to us. Losing him, having to say good-bye and let go felt like all the air left the earth and the lights went out. It felt dark for a long time, then the fog settled in and stayed for what seems like a lifetime. It didn’t (and still doesn’t at times) feel real – that he’s gone. He was perfect. 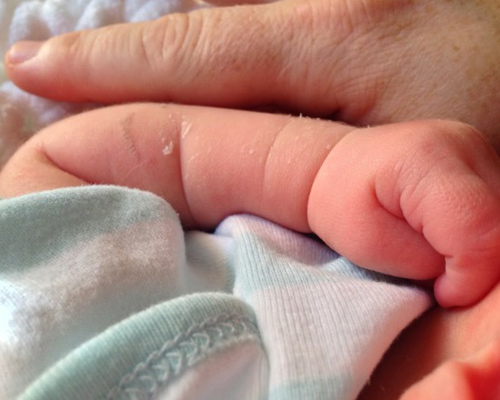 Each little finger, each little toe, his button nose and soft blonde hair, and his precious little chin. I loved every bit of him so much that on his second last day I photographed his toes and arms and held my fingers up to him to show the comparison. 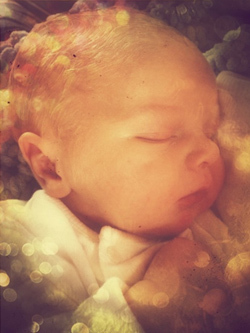 He was so little, I had forgotten how little newborns are and couldn’t believe how incredibly cute he was. I had imagined him for years hoping for a second child, so to finally hold him and admire him was the most peaceful experience of my life. I loved every bit of him so much that on his second last day I photographed his toes and arms and held my fingers up to him to show the comparison. 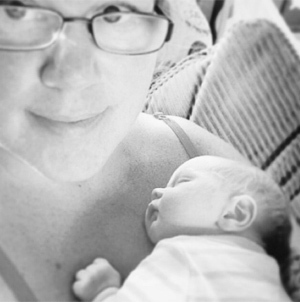 With my first baby, Hannah, I was like any first time parent fumbling through it all. With my third, our rainbow baby, Oliver, I was terrified most of the time (I still am)…, but with Finn I only remember feeling peace. He was a breath of fresh new life after the loss of my mother to breast cancer four months earlier. He was a new direction, an exciting new chapter. I had been a mother to a daughter for fifteen years, so to now be a mother to a son was surely going to be an adventure. While expecting Finn I was excitedly preparing to take photographs of our new little one wearing a collection of crochet and knit hats that I had purchased through Etsy makers. At the time I did not know how to knit, crochet, or felt, but I was an admirer of all the fibre arts and received many top marks from my mother for being an excellent yarn ball roller. In the short time Finn was with us I didn’t get a chance to take any of the photos I had planned. What I did capture is better than anything I could have planned. It was the morning of September 27th, I had Finn with me upstairs, and the sun was softly rising through our bedroom window, the light was just right to fall across a newborn’s waking face. I tossed a backdrop sheet from my waiting pile across our bed, slipped off Finn’s sleeper (to capture as much of his soft skin as possible), lay him on the sheet and gently placed the little rainbow striped knit elf hat over his head. I took three photos with my iPhone before quickly slipping him back in his sleeper to stay warm. I didn’t take the photos too seriously, assuming I would retake a similar one with more effort using my "real camera" and better props. It's amazing now, to think how easily I brushed off that moment at the time because it's such a deeply treasured memory now. He was so cute in that hat, and his little eyes were peeking back at the sun. His eyes were open a lot for a newborn, and that morning he was taking it all in. Finn’s rainbow elf hat now hangs in a shadow box opposite his photo wearing it. It is what I’ve modelled all of my infant elf hats by. I learned to crochet about a year after Finn lived and died. My thoughtful friend Sheri taught me a few simple stitches and sent me off with the confidence that I would know what to do next…, and I did. I had already found a new passion in needle felting. What developed was a love for wool, and a deeper respect for the animals who provide us with beautiful workable fibre. Through that, a quirky art I think I’ve always fostered started to take centre stage. It began with making thank you gifts for the people who helped us the most and grew into an outlet to provide handmade, thoughtfully made keepsakes for all kinds of people. 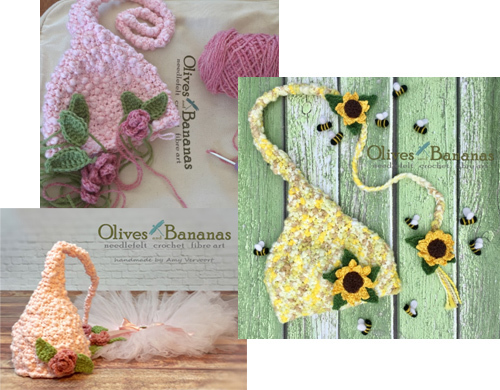 Combining crochet with my needle felted projects resulted in the development of Olives and Bananas, a small 'made by me' business named in honour of my three children. Oliver and Hannah are held together in my logo with a small dragonfly representing my little Finn, who inspired it all. 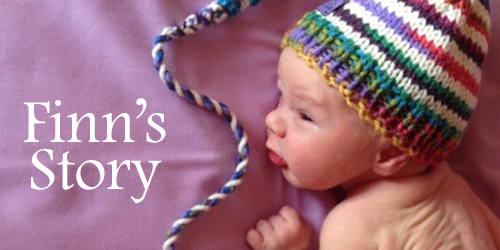 Inspired by Finn’s rainbow hat, each one of my hats is crocheted with care and with the hope that it will become a treasured keepsake. I use the softest yarns, most coming from the best fibre colourists who create gorgeous small batch skeins. Each hat is a one of a kind, and though I make similar ones no two are ever the same. 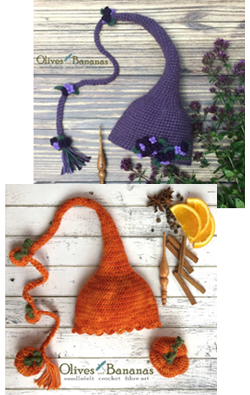 Designs grow in my garden: foliage, flowers, herbs and vegetables appear on my hats. Some decorations are felted wool, others crocheted; all coming together to create something beautiful. These hats make an eye catching photography prop. 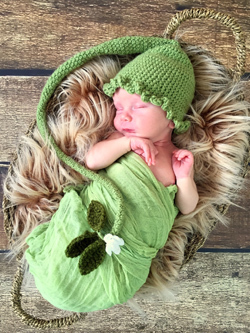 When I was planning infant photos while expecting Finn I found myself most attracted to these elf hat photos and the versatility of how they were used in photos. I still love the elf hats for so many reasons and never tire of the photos I see of them being worn. Finn's little brother, Oliver, posed long enough for me to take about three photographs of him wearing my first "sweet pea" elf hat. Finn’s little brother, Oliver, who was not a very willing participant in infant photos, posed long enough for me to take about three photographs of him wearing my first "sweet pea" elf hat. 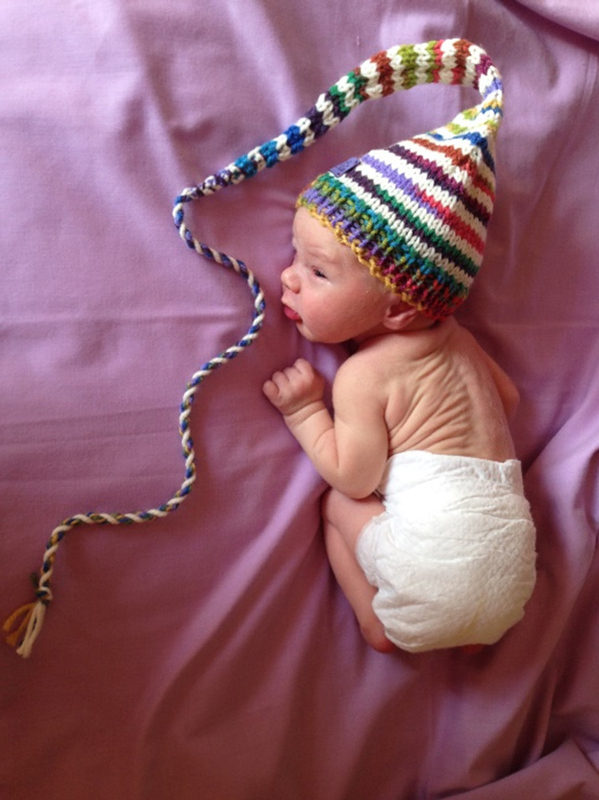 This was one of the first hats I made and it is tucked away with other precious memories of his early months. I have a dear photographer friend, Mell, who stands firmly in the school of photograph everything, every minute, every glance, every memory, all the time.., a school I was wary of stepping into not wanting to always have a camera in Finn’s face, but I couldn’t help myself and I felt a bit guilty doing so. I don’t anymore. I stand firmly beside Mell. Had I not been so camera crazy with Finn I wouldn’t have such a precious collection of his short life. I wish I had taken more. I do hope that Finn’s story also inspires people to capture more moments. The more I learn about the art of yarn the more I’m drawn to creating hats that are truly unique. Wool from thoughtful animal carers (I’ve been buying more and more and more from sheep, goat, and alpaca rescues) dyed and painted in small batches. Not only is this the nicest yarn to work with, but it feels like the next step in the creative process. There is a lot of time and effort put into each hat. All hats come with a sweet hand painted hat box. This is more than a purchase, this a donation from both myself (I do not recoup costs) and those purchasing hats toward NICU services. 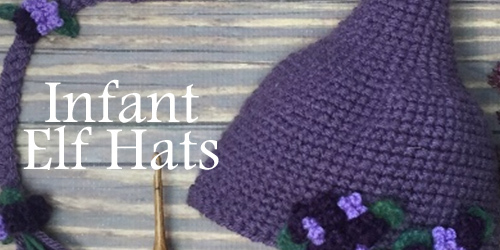 It’s healing for me to make these hats, both in the process of making them and knowing that the proceeds will go to the tiny ones, like Finn, who are full of hopes and dreams... to help them go home with their parents and make those dreams come true. I try to remember what it was like when I was expecting Finn and how fearless I felt once he was born healthy and home. There’s strength in that.